Richard Spencer, a white supremacist and the leader of the alt-right, said the fire would have “served a glorious purpose” if it pushed the “White man into action”. 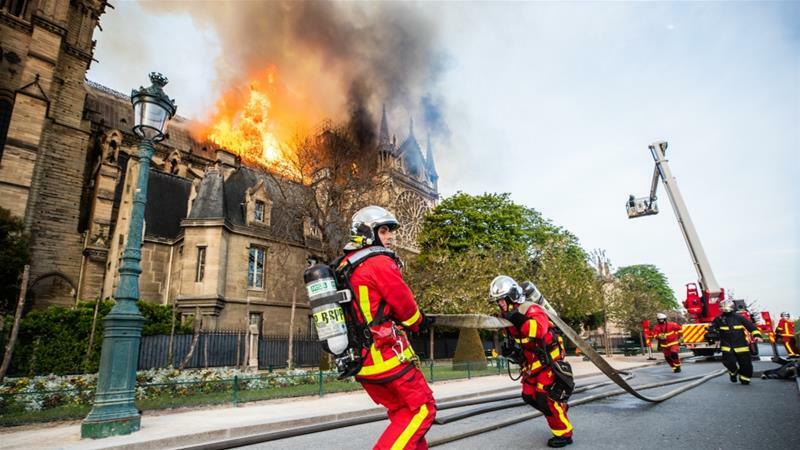 Similarly, Pamela Geller, an anti-Muslim public figure, posted a photograph of two men who appeared to stand near the scene of the Notre Dame fire. In her post, she said: “Jihadists reveled … sharing media photos of the flames billowing smoke, and comments expressing their joy”. Far-right politicians in Europe have also attempted to link the fire to rising “intolerance” against Christians on the continent. Alice Weidel, the parliamentary group leader of the Alternative for Germany (AfD), Germany’s largest opposition party and first far-right nationalist movement to enter parliament since World War II, linked the incident to previous attacks in France. The AfD’s original purpose was to promote a eurosceptic agenda, but the party has since shifted its focus to immigration and Islam. “During Holy Week #NotreDame burns. March: second largest church Saint-Sulpice burns. February: 47 attacks in France,” Weidel wrote on Twitter. “The Observatory on Intolerance and Discrimination Against Christians in Europe speaks of a significant increase,” she added, including a link to an article published in March in a German Catholic magazine. Ali Abunimah, the cofounder of Electronic Intifada, an online magazine that documents the Israeli occupation, warned in a Twitter post that a narrative is being created “based on nothing”. Tell MAMA, a UK group which monitors hate crime, called on people to “reject such narratives and Islamophobic dog whistles”, as it highlighted a series of posts from figures including Katie Hopkins, Frank Gaffney, Stefan Molyneux and Paul Joseph Watson. On French TV @BFMTV a commentator is comparing #NotreDame fire to Taliban’s destruction of Bamyan Buddhas and 9/11. They are creating a narrative, based on nothing, that Muslims are to blame.